Back in 2016 I opened a metal playlist on Spotify to discover new bands. That’s when I discovered Skindred. I started listening to ‘Union Black’ and ‘Volume’, and actually was a bit shocked by the music itself. I heard a combination of reggae and some kind of nu metal: so-called ragga metal. This was the first time I had heard something like this and thought it was quite amusing. Now with their new album “Big Tings”, Skindred wants to experiment a bit. On April 27, 2018 the band released this new album, featuring 10 brand new tracks, which sounds quite different from their previous albums. On this album the heavy guitars sound quite muted, when you compare them to background vocals and the drums. The songs are also a lot catchier than the tracks from ‘Union Black’. This is probably caused by the bass lines, sounding a bit distorted. For example the title track ‘Big Tings’ gives off a relaxed vibe, and features very calm vocals. Although the Welsh band has changed their way of making songs, thanks to the vocals of Benji Webbe, Skindred still keeps it’s own distinct sound. ‘Big Tings’ features multiple songs, such as ‘That’s My Jam’ and ‘All The Time’, where the singer uses the same vocal skills as on previous album’s. These are the songs that feature a very fast tempo and raw vocals. I also have to mention that my all time favorite song of Skindred is called ‘Cut Dem’, because of the incredible vocal range and it’s energetic vibe. I also recognized this energetic vibe in the track ‘Alive’, which is probably my favorite song on this album. A key word that really describes this album is variation. As I mentioned before, they have a few songs wich sound a bit like other classics from Skindred, and they have a new kind of way of making catchier music. Another important track to mention is ‘Machine’. This song seems to be heavily inspired by AC/DC. The track also features Gary Stringer (the singer of Reef) and Phil Campbell (guitarist of Mötorhead). It really differs from the rest of the album. Also important are the slow regga-metal songs. The tracks ‘Tell Me’ and ‘Saying It Now’ are very calm, and really stand out from the rest of ‘Big Tings’. Upon reading some reviews of their concerts, I concluded that their fans are seldomly disappointed in their performances. I would love to visit one of those concerts one day, but so far I have only found tour places in the United Kingdom. They will probably tour further than that in the future, so I hope I’ll be one of the lucky ones that gets the chance to go to one of their concerts. 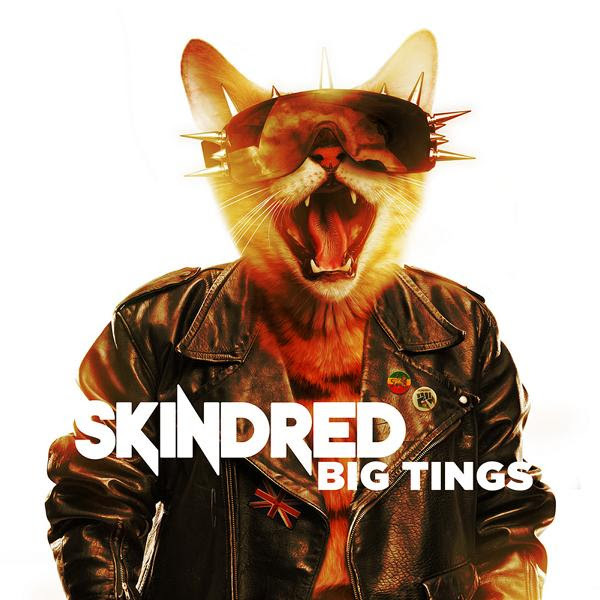 Some people might think that ‘Big Tings’ is some kind of modern sell out, but the fact that Skindred is turning in a more mainstream direction is not at all going to pollute the Ragga Metal. This album sounds like they have moved on to take a new step towards success. Skindred’s small change of sound could start something new, and I expect their fanbase to grow considerably. Horns up for Jeremy! He writes awesome album and EP reviews of all kinds of international metal bands.